Corn on the cob is one of the very best things about summer, no? I get so excited when I see the farm stands open in my neighborhood. The corn is always piled high and I load up several times a week to enjoy with our dinner. It’s fun to change things up and roast (or grill) the corn rather than boiling it. 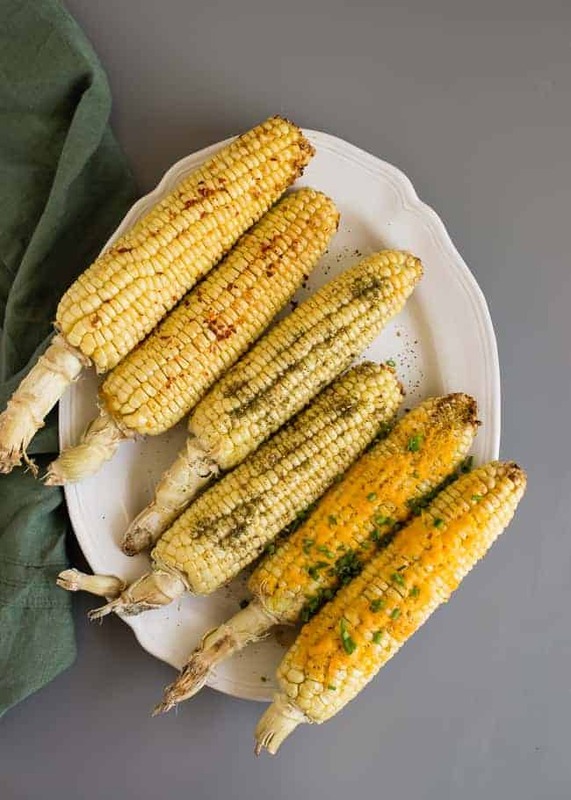 Corn is certainly yummy on it’s own, but I have three fun ways to spruce up roasted corn this summer. If you like caramel corn and spicy food, this is the corn for you. It’s buttery and sweet with just the right amount of spice. 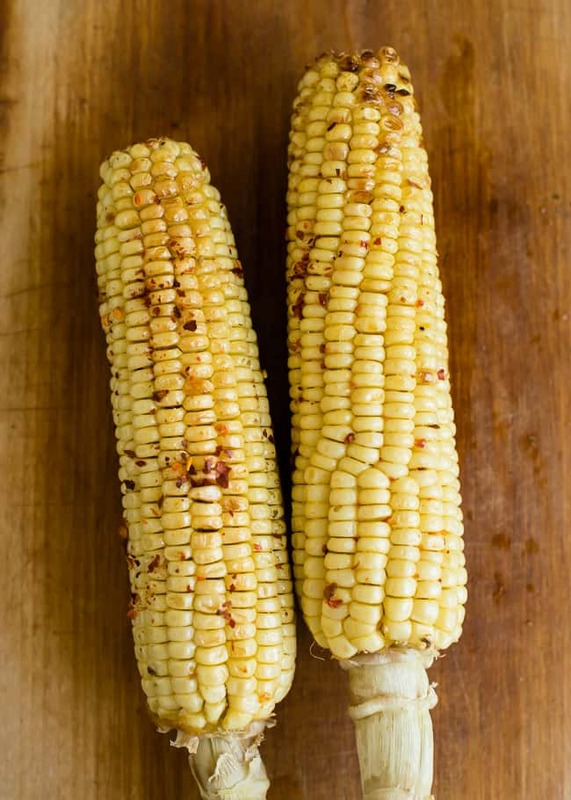 Fresh corn is brushed with a maple-brown sugar glaze and quick roasted under a hot broiler. It’s utterly addictive. Maple and brown sugar mixed with spicy Asian chile paste make a tasty glaze for corn on the cob. Preheat oven broiler to low or grill to medium-high heat. Have a broiler pan ready if using oven. Line it with foil. If using grill, brush grates with oil. In a small pan, melt butter and add the brown sugar, maple syrup, and all of the spices. Bring to a simmer and cook until sugar is dissolved and the mixture reduces a bit, about 5-10 minutes. Brush the glaze over the corn. Place corn on broiler pan or grill grates. Let cook between 8-10 minutes, turning halfway through cooking time. It's okay if it blackens in spots. Remove from heat and serve with the remaining glaze on the side. Za’atar is a Middle Eastern spice blend made with sumac, thyme, and sesame seeds. It’s perfect mixed with butter and a little garlic as it melts into all the nooks and crannies of the hot roasted corn. 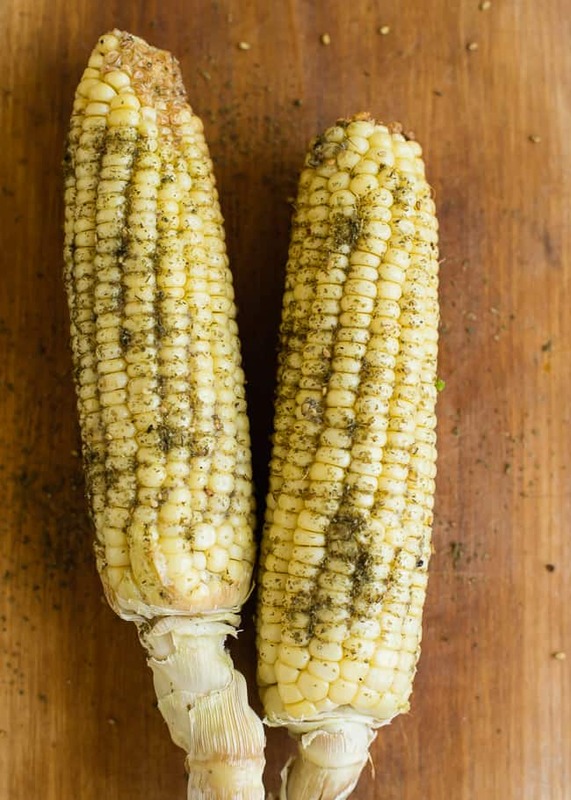 Roasted corn gets a little Middle Eastern flavor from za'atar, plus a hit of garlic. Stir together butter, za'atar, garlic, and sea salt in a small bowl. Lay a square of plastic wrap or waxed paper on a clean surface. Place the seasoned butter onto the plastic wrap and form into log. Wrap tightly and place in the freezer to firm up. Place corn on broiler pan or on the grill. Let cook for 8-10 minutes, turning as needed for even cooking. It's okay if it blackens in spots. Remove from heat and top with 1 Tablespoon of the chilled seasoned butter. Serve immediately. Cheddar and chives are a classic combo, and taste even better together paired with corn on the cob. The heat of the roasted corn melts the cheese on contact. This is a definite favorite at my house! 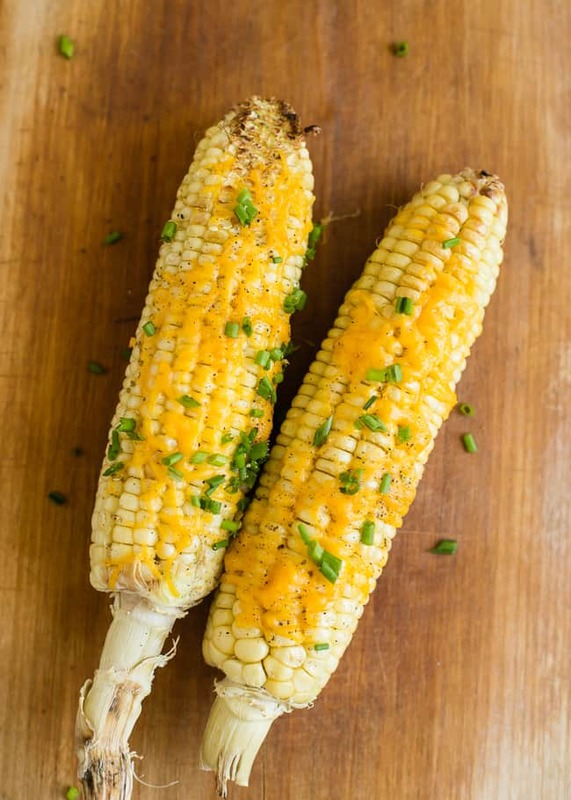 Roasted corn with melted cheddar and topped with fresh chives. Place corn on broiler pan or on the grill. Let cook for 8-10 minutes, turning as needed for even cooking. It's okay if it blackens in spots. Remove from heat and top with 1/2 Tablespoon of butter, spread it all over the cob, letting it melt. Season well with salt and pepper. Sprinkle each cob with 1 Tablespoon cheddar cheese and chives. Serve immediately. How do you like corn on the cob? Looks very interesting! First time I see something like this. Happy I’ve come across the idea! These look like they’d be perfect for a BBQ! I love fresh corn, it’s one of my favorite veggies. Thanks for sharing!